Fight fans can look ahead to a big weekend of fight action on August 26. As per a news story on RingTV.com, FOX will carry a two-fight card right before the big crossover “Super Fight” that will pit boxer Floyd Mayweather against MMA warrior Conor McGregor. The full under-card for the Las Vegas show is yet to be determined/announced, and thus far only one of the FOX bouts has been confirmed: former IBF welterweight boss Shawn Porter will face Thomas Dulorme, an industry source told Ring. 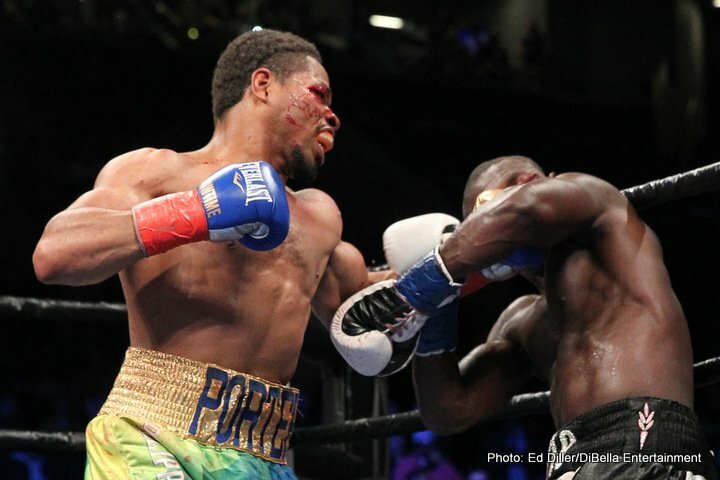 Porter, an all-action fighter who is looking at a WBC final eliminator against former champ Danny Garcia later this year, wants to keep his tools sharpened. Dulorme, 24-2(16) may or may not give the former champ a good fight. The Puerto Rican was once a highly touted prospect, but stoppage losses to Luis Carlos Abregu and Terence Crawford, though far from anything to be ashamed of, the Crawford loss especially, derailed him somewhat. Still, the 27 year old does own wins over good fighters such as DeMarcus Corley, Karim Mayfield and Henry Lundy. Can Porter become a two-time champ? It’s certainly going to be a lot of fun finding out. Rarely if ever is “Showtime” in a dull fight, Porter’s mini-Joe Frazier imitation frequently sending the fans home happy. Chances are Porter will stop Dulorme, perhaps late on, as he keeps himself busy. Still Dulorme, despite having fought a number of his career fights at 140 pounds, is no gimme. Porter will be in top shape, you can count on that. Stay tuned to find out what the second fight on the FOX card is. But will The Big One, the most heavily hyped fight of the year, deliver action on that Saturday night next month? Tickets are reportedly shifting for big, big, silly money, so there is clearly no shortage in fan interest. If we do get to see a “real” fight on August 26 in Vegas, that whole weekend might just be something very special. Don’t forget, the great Miguel Cotto is also in action that weekend, when he will face Yoshihiro Kamegai for the vacant WBO 154 pound belt.